Yet another Twitter user has started posting and seems to be of interest. 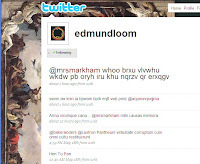 This user has just started following Elliott Graves, and is posting using substitution cyphers. The twitter account that decodes to link to Simeon Hobbes is a real account, but I think is in on the edmundloom/mrsmarkham conspiracy. I still don't believe them. Thanks for all the work and keeping things up to date!